The holiday of Sukkot arrives at the most beautiful time of the year: The trees slowly transform themselves from lush tones of green to vivid shades of gold, ochre, vermilion, and fuchsia. Nature beautifies our surroundings as we build our sukkot, booths, and decorate them with the seven species of the Land of Israel and the four species of Sukkot. Once our sukkah is built and adorned, it is traditional to serve a festive meal that celebrates the opulence of the fall harvest. You can have fun picking your own pumpkins, apples, and cranberries. Pennsylvania has a tradition of gathering black walnuts in its forests. The nuts come encased in a round, green fruit. The best way to extract the drupe is to hit the fruit with a hammer against a hard surface. You can harvest your own at Hill Creek Farm. Of course, you may purchase all of these fruits in your local stores. Here is a delicious and easy recipe that incorporates the fall bounty. It is sweetened with locally produced maple sugar. Slice the top off the pumpkin. Scoop out the fibrous strands and seeds. Core and dice the apples. In a large bowl, mix the apples, cranberries, black walnuts, maple sugar, and cinnamon. Fill the pumpkin with this mixture. Cut up the butter, and insert into the filling. Place the stuffed pumpkin on a cookie sheet covered with parchment paper. To serve, scoop out some pumpkin from the sides along with the filling. As Arctic winds blow into Philadelphia, and the snow piles up, our instinct to consume warm, hearty soups kicks in. This is an opportunity to make use of the many varieties of pumpkins and squashes that are widely available now. Pumpkins are high in vitamin A, and have a good amount of vitamin C, iron, and calcium. Also, they are fat free. When combined with onions, garlic, ginger, herbs, and spices, the pumpkin shines as a winter entree soup. Pumpkin-ginger soup can be served with a green salad, a hearty bread, and a selection of cheeses. Heat the olive oil in a heavy pot over medium heat. Saute the onions, garlic, and ginger until the onion is translucent. Add the coconut milk and the pureed pumpkin. Bring to a boil, then lower the heat to a simmer. Season to taste with curry powder, cinnamon, salt, and pepper. Serve garnished with cilantro, scallions, and toasted sunflower seeds. I first wrote about the vegan Vgë Café in Bryn Mawr when it just opened last spring. On a visit some time later, the Brazilian proprietor, Fernando Peralta, expressed to me his interest in obtaining kosher certification because his customers were asking for it. I advised him to speak with the owners of other vegetarian establishments. Lo and behold, I was delighted to hear right before Pesach that he is indeed now certified kosher. The kosher supervisors are Rabbis Eli Hirsch and Zev Schwarcz from the International Kosher Council, the same agency that certifies other local establishments such as Singapore Vegetarian Restaurant, Blackbird Pizzeria, and Sweet Freedom Bakery. The IKC is based in New York (it supervises the popular Blossom restaurants) and they’ve recently expanded to Mexico, Portugal, and Ukraine. It was Rachel Klein of Miss Rachel’s Pantry who led Peralta to IKC. “We are a vegan restaurant and already had proper procedures in place for cleaning vegetables, so the process was quite simple,” said Peralta. He only had to change the balsamic vinegar that he was using. The inspection covered all the ingredients and products used in his establishment. His café will be inspected on a biweekly basis, with no advance notice. Being non-Jewish, Peralta was not asked to close on Shabbat. Vgë Café, located at 845B West Lancaster Avenue in Bryn Mawr, is open Mondays through Saturdays from 11:30 AM to 8:30 PM and Sundays, from 11:30 AM to 3:30 PM. Catering is available. Phone: (610) 527-3091. In these cold January days, what can be better than soup and salad? Try the delicious combination of mushroom-quinoa soup and heart of palm salad. It is gluten, dairy, meat and soy free! Full recipe and picture after the jump. Put vegetable broth and water in the pot on medium heat for 5-6 minutes. Add spices, stirring in between each addition and let simmer for another 5-6 minutes. Once it’s boiling, add quinoa and minced garlic. Simmer on low for 15-25 minutes, or until quinoa is cooked through. Serve with freshly ground black pepper! 6 hearts of palm (if they are short. if they are long, you only need three). Note: make sure there isn’t extra salt or flavoring, you won’t need it! Chop tomatoes, cucumbers and onions into small squares. Slice hearts of palm (about 2cm each), and then in half. Separate lettuce and then slice into 2 inch pieces. Combine all ingredients until mustard has incorporated into the olive oil. Drizzle on the salad, tossing well so it’s fully covered. Talia spends a lot of her time in the kitchen preparing copious amounts of experimental foods, which she tests on her very patient and consequently well-fed family and friends. Although she came to the states from Israel when she was just a toddler, she retains her love of loud, passionate discussions and homemade hummus. When she is not in “balabuste” mode, she makes a living composing, singing and performing. Talia also gives workshops to young singers to teach them healthy vocal, performance and audition technique. Stuffed vegetables are prevalent in many Middle Eastern and European countries, each with their own twist and their own flavor profiles. The Greek gemista stuffed veggies will use pine nuts, cinnamon and mint; Italian verdure ripieni include Parmesan cheese and bread crumbs; filfil rumi mahsi, Egyptian stuffed peppers, use allspice, currants and tumeric; Balakan stuffed peppers (names vary by country, but are called punjena paprika in Serbia, Bosnia and Montenegro) are characterized by their use of paprika; and Ashkenazi stuffed cabbage, naturally, has a sweet sauce. My favorite are Israeli stuffed vegetables. I think that the version we make in my house (my husband is the stuffed vegetables master) is a combination of the best of all the recipes, with all the exciting and palate tickling flavors that define Israeli cuisine. The addition of hot paprika, cumin, chili and coriander give this recipe its distinctive Israeli character. Admittedly, making stuffed vegetables is a bit of a project, but the results are mouthwatering. The combination of meat, vegetables and rice all in one dish also means that once you’ve made this, you don’t need a whole lot more to round out a full meal, so it may take some time, but it really is a meal in a pot. The Israeli version does not discriminate when it comes to the vegetables. Any vegetable that can be scooped out or can wrap around the filling can be used in this dish. We generally use peppers, zucchini and onions, but you can also use tomatoes, cabbage, eggplant, or any other vegetable that can be stuffed. This recipe can also be made as vegetarian by simple omitting the meat. It’s just as delicious without it and is a great vegetarian main course. Prepare the vegetables: For the peppers, slice around the top of the pepper, near the stem and remove the “lid”, setting aside. Remove the seeds and pulp. For the zucchini, from the cut side, using a very small teaspoon or an apple corer, remove the seeds making sure you don’t pierce the bottom. For the onion, place the peeled onion in a pot of boiling water and cook for about 5 minutes. Then make a cut from the top to the bottom of the onion and carefully remove as many of the large outer layers of the onion as you can and set aside. In a large wok or skillet, heat up the olive oil. Saute the chopped onion until soft. Add the garlic and saute for less than a minute, making sure it doesn’t burn. Add the mince and cook until there is no longer any pink meat. (For vegetarian, omit the meat) Add the 100g tomato paste and mix. Add the rest of the herbs and spices and saute for another few minutes until it’s all releasing lots of wonderful aromas. Add the stock and mix. Remove from the heat and add the rice, mixing well till combined. Add some of this mixture to each vegetable – fill to no higher than 1 cm from the top of the vegetable and fill it loosely as the rice will expand when cooking. For the onion, place one or two sheets of onion on a clean surface and put about 1 tablespoon of filling in the middle and loosely wrap the onion around the filling so that there is a double layer of onion around the filling. You can do the same for cabbage leaves that you have also boiled in water for a few minutes. Place the peppers bottom side down in a large, wide pot, and place the “lids” of the peppers back on top (this is just for show). Add the rest of the vegetables in the spaces, making sure the openings are facing upward. Mix together the ingredients for the tomato broth and pour over the vegetables, making sure the liquid covers all the vegetables. This is essential to ensure that all the rice cooks. Cover the pot. Bring to a boil and reduce the heat. Simmer for 30-40 minutes or until the rice begins to overflow from the peppers and the vegetables are all cooked. Margo Sugarman is the creator of The Kosher Blogger, a celebration of keeping kosher and loving good food. What should you serve the non-meat eaters in your circle for the Fourth of July barbecue? This year, surprise them with a delicious, satisfying meal of marinated vegetables and grilled cheese skewers. Sheep’s milk cheese is good for grilling. It can withstand very high heat without melting. When you grill it, it develops a delicious golden crust and a firm salty texture. You can mix your choice of vegetables such as cherry tomatoes, squash, eggplant, pepper, onion, and mushrooms in a marinade to infuse them with flavor. Below is a recipe for a homemade marinade from Israel that will keep the inside of your vegetables moist when you grill them. Mix in the desired vegetables with the marinade. Soak some bamboo skewers in water. Dice your sheep’s milk cheese. Trader Joe’s sells a wonderful sheep’s milk feta from Israel called Pastures Of Eden Israeli Feta Cheese. This cheese works really well in this recipe. You may also order Israeli specialty cheeses online. 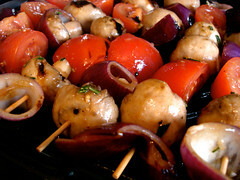 Thread the bamboo skewers with the marinated vegetables and cubed cheese. Grill over low-medium heat for 5-7 minutes. Serve with rice pilaf and a crisp, green salad. This repast is vegetarian and gluten-free.